Response to "Some additional info"
The previous post is a bit disturbing. Although is identified as helpful information for folks considering Mark Gold's position, you have also included some out of context statements from "the review of the current LHS facility" that could be interpreted as an effort on your part to help rehabilitate Mr. Gold's thoroughly discredited arguments, which he has back peddled away from with each succeeding iteration of his position. If your aim was to prop up Gold's claim that we could save money on this part of the project, then you are helping to misinform the public. Gold's claims would be debatable, if discussed in a vacuum, but given the fiscal and technical specifics of our present situation, they serve only to false suggest that the proposed option could still be modified without cost increases that far outweigh the "potential" savings he "hopes" for. Mr. Gold's claims about the MSBA procedures have been refuted by several more well informed sources and will again be refuted by Katherine Craven of the MSBA on May 19th when she speaks here in Longmeadow. Gold writes, "There remains, however, opportunity to adjust the project scope and to control costs for the $9.4 million portion of the project related to renovations for School Administration offices, the pool, and LCTV without putting the state grant money at risk." THIS CLAIM IS COMPLETELY FALSE, and reflects Mr. Gold's failure to consult with knowledgeable officials about the process or to follow it closely himself. Obviously, Gold is in a difficult political position. He has endeared himself to the "no" constituency and has tried to legitimate their position, to no avail. While Mr. Gold and Mr. Nolet and Mr. Wojcik and Mr. Fregeau have every right to oppose the project, they don't have the right to make up their own facts. Nor should voters be encouraged to entertain their post hoc speculation about matters fully discussed, debated and rejected during the lengthy process to date. The MSBA will not provide any funding for a high school project in the coming year if the present proposal is defeated. There is absolutely no guarantee that they will fund an alternative proposal next year either, and both the costs and favorable bond market will be less favorable. Mr. Gold wants to save us money and prevent us from failing to fund other needs in the near future, both reasonable goals, but his proposal will simply cost us more for less in both the short and long run. Finally, and possibly most disturbingly, Gold indicates a desire to "balance of our school and town services," which given his argument on this project is more than just a handy expression. Schools ARE town services! Gold's most visible supporters have endeavored for years to divide the town between pro and anti school "interests," apparently without any appreciation of the consequences of a "house divided." The present project is in the interests of THE ENTIRE TOWN! Ironically, even the anti-school crowd in town, that is presently trying to frighten seniors and library patrons into voting no, will reap financial benefits from the new high school project, despite their objections and obstructions. Below is a schematic drawing of the first floor current building configuration showing the various additions including the 1971 wing (pool + library + BTC/open space). 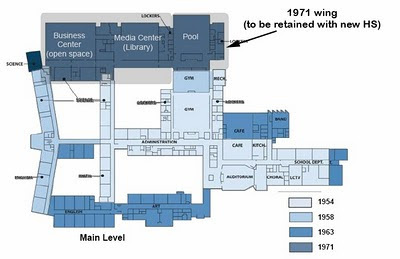 During the review of the current LHS facility, there were positive comments made about the condition of the 1971 wing which were presented at numerous SBC public forums. The 1971 wing is structurally in better shape and has a higher potential for minor renovations. The roof is in satisfactory condition. Pool systems are in good condition. 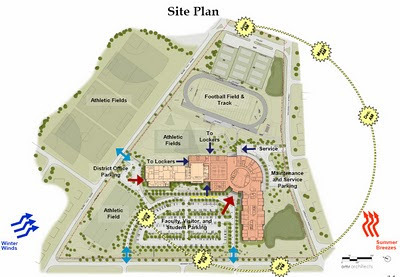 Here is a graphic showing the entire site plan for the new HS project. Below is a letter posted this week on Mark Gold's re-election website explaining his position on the Longmeadow High School building project. One of the major issues to be addressed by the residents of Longmeadow this year is whether or not to approve the proposed high school plan. The current proposal is actually two projects in one: construction of a new classroom building and the renovation the 1971 wing. $65.6 million of the costs (all related to new construction) is eligible for 51.8% state reimbursement. The balance of the project’s $78.4 million project cost will be paid for though a $44.4 million debt exclusion bond. 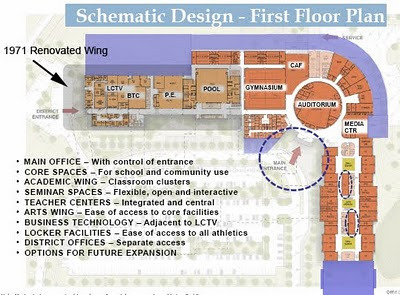 In the six years (2003-2009) I served as chair of the Capital Planning committee, recognizing the needs of the high school building, I led the Capital Planning Committee in recommending the appropriation and expenditure of over $500,000 to address physical plant needs of the high school. The needs of the high school building are very clear – particularly the physical plant issues such as heating and electrical systems, classroom amenities, and handicap accessibility. Despite the fact that the proposed project includes shortcomings that concern me, and that I would have preferred the townspeople to have been allowed direct input into selection of the final project alternative, the fact is we are presented with the project that is before us: a 186,000 sq. ft. classroom building tied to a renovated 1971 wing. There remains, however, opportunity to adjust the project scope and to control costs for the $9.4 million portion of the project related to renovations for School Administration offices, the pool, and LCTV without putting the state grant money at risk. A revised plan for financing the project that reduces the financial burden that this bond will put on the most vulnerable residents of Longmeadow can also be developed without putting reimbursement funds at risk. Based upon the effect that the current project is likely to have on the taxpayers of Longmeadow, I am concerned that passage of this project in its current form will restrict the town’s ability to raise funds necessary for future capital needs and / or to maintain current service levels at the schools and town departments. If the issues related to expenditures for renovations to accommodate the School Department offices and the proposed financing schedule are modified to lessen the financial impact to the community I would support this project. However, as currently proposed I cannot support a project that includes the financial burdens imposed. Should the town-wide vote reject the debt-exclusion proposal, I will suggest that the School Building Committee use the MSBA’s appeal process to, at a minimum, revise the scope of the noneligible portions of the project and alter the proposed financing plan for this project to lessen the financial burden of this project for the five to ten year period after project completion. In summary, my objection to the proposed Longmeadow High School construction and renovation project is based on the financial burden this project will have on town residents, and the limiting effect the cost of this project may have on residents’ willingness to raise other necessary funds over the next five to ten years. With modifications to this project, and within the scope of the MSBA policies, we can provide adequate educational facilities for our students without constraining our willingness or ability to maintain the level and balance of our school and town services. The following is an open letter to Longmeadow residents from Christine Swanson that will appear in the papers soon (I hope). In it, she meticulously corrects several of the misimpressions out there about the proposed debt exclusion override and clearly identifies the fiscal advantages of the proposal. The patience, prose, and detailed knowledge of the issue evidenced in this letter is a fantastic example of how wise it is to support former School Committee members running for the Select Board. She will most definately bring valuable institutional and organizational knowledge to the Select Board. If you don't support the High School project and Christine Swanson's candidacy after reading her analysis, then I can't imagine how you are making your decisions. The most critical need in this town is purposeful planning and development of long and short term solutions to address revenue shortfalls, infrastructure needs and maintaining town services. Without a plan in place, residents find themselves paralyzed from taking action based on what may be perceived as an overwhelming, monumental list of issues. Well, I for one do not cower in the face of huge challenges but rather step up to create solutions. This is what I have been known for in my business career and what I bring to the table as a Select Board Member. This brings me to what some may call the largest issue this town has ever faced to what I call the greatest opportunity ever presented to the town. Of course, I am speaking of the Longmeadow High School Project. As the Co-Chair of the School Building Committee, my position on the project is clear: I absolutely support this project and based on my three years working through the process, I am 100 percent certain that this is the best long term solution for the entire Town of Longmeadow. 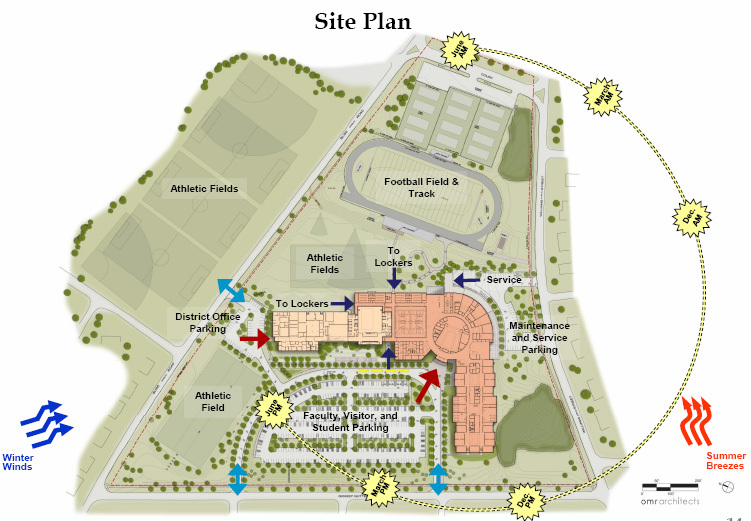 One of my fellow candidates for Select Board, Mark Gold, developed and released several position statements in the last few months regarding the Longmeadow High School Building project. In these documents, that have been emailed to residents and/or posted on his web site, Mr. Gold makes comparisons between the Hampden-Wilbraham Minnechaug Regional High School building project and the Longmeadow High School building project. While these two projects may seem similar, they are quite different. All the data for the Longmeadow High School project is available on line at www.longmeadow.org/sbc or in hard copy at Storrs library. I hope the following information will assist Mr. Gold and the residents of Longmeadow with a greater understanding of this project. I apologize in advance for the length of this document but felt that it was important to provide as much information as possible. 1)Hampden/Wilbraham did not do a comprehensive feasibility study to determine current conditions. They were offered a model school option and chose to move forward. Longmeadow residents chose to do a more comprehensive feasibility study that looked at every major component of the building including systems, structure, health and safety and code compliance to determine the best and most economical long term solution. Eight options ranging from minor renovation to model school were reviewed, analyzed and scored against a decision matrix. The results of this matrix and the eight options considered were shared at several public forums and posted online. However, Mr. Gold incorrectly states in an email to several residents: “the School Building Committee (SBC) looked at one renovation option and only one renovation option. They did not look system by system (heating, electrical, ADA, etc), but rather looked only at a "gut it to the studs and start over" job.” Had Mr. Gold reviewed the feasibility study that has been available on line and at Storrs Library since October of 2009, he would have noted the eight options that were reviewed by the SBC including the renovation of just systems and code compliance. To reiterate, the School Building Committee did consider 8 different options all of which may be found as part of the feasibility study and can be found on line as well as at Storrs Library. Several options of renovation were considered but the MSBA and the SBC agreed that the most economical long term solution was the selected option of partial reno and partial new construction. Mr. Gold also states in his email “The SBC discounts the Kaestle Boos study because it only cost us a few $10's of thousands of dollars. They preferentially cite the study done by their architect which only studied the total gut alternative.” Again, this is incorrect. The MSBA reviewed the Kaestle Boos study and found it deficient in many areas, hence the MSBA requirement for Longmeadow to complete a feasibility study. As stated above, eight options, not one, were considered and of those eight, three were submitted for cost estimates. All the details are provided and available on line at the SBC website. In actuality, Minnechaug is estimated to be 248,000 square feet including their pool and district offices and Longmeadow High School will be 237,000 square feet; a difference of roughly 4.6%. In addition, the MSBA agreed upon enrollment for Longmeadow is 1000 students and Minnechaug is 1225. 3)Mr. Gold claims that Longmeadow High School is 22% more expensive than Minnechaug. In reality, the total projected cost of Minnechaug is $82 million versus $78.5 million for Longmeadow High School. When Mr. Gold makes his statements about cost it is clear that he does not understand the reimbursement calculations for MSBA funding. While it is true that Hampden/Wilbraham will be receiving a larger percentage of reimbursement; similar to the Chapter 70 funding formula for state aid, reimbursement from the MSBA takes into consideration wealth factors, property values and other economic decision points. This is why Hampden/Wilbraham’s base reimbursement rate was higher than Longmeadow’s and their overall state grant is also higher based on additional reimbursement points for a model school. Mr. Gold also states in his email, “Starting with the fact that we're paying $9.4million to keep the pool and build offices for the School Department - and all of that is our money, not state reimbursement. If rebuilding a pool is $3million of that $9.4m, then we're paying $6.4m for office space. Kind of steep when Minnechaug's version of pool and office renovation is $5.4M vs. our $9.4"
All the data pertaining to the ‘71 wing renovation may be found in the feasibility study and in schematic design documents. Mr. Gold is incorrect with his statements regarding the renovation and comparison with Minnechaug. First, Minnechaug is not renovating their district offices and pool but rather building new spaces as part of the overall building for a total square footage of 17k. Longmeadow will be renovating the ‘71 building that will house the pool and district offices but will also include an additional gymnasium, weight room, business and technology classrooms, the health classroom and studio and office space for LCTV for a total of 52k sq feet. While Mr. Gold implies that we are paying almost double for the pool and district office space, he fails to state that we are getting almost three times the square footage with more usable space then just district offices and a pool. Secondly, Mr. Gold does not understand the MSBA building restrictions or the vetting process completed by the SBC. MSBA has strict guidelines for the size of auditoriums and the SBC did challenge the MBSA’s seating restriction and to have an exception made for more seating but to no avail. Mr. Gold suggests a scaled down more piece meal approach to upgrades/renovation. Mr. Gold proposes that we can vote down this project and still receive funding from MSBA for a different project of modified scope. His assertion is certainly not grounded in any documentation from the MSBA and is contrary to their “failed vote policy”. Construction planners are creative, however, if is not as simple as renovating a room at a time. Once the walls are opened there is significant abatement of hazardous material necessary and this process should not take place with students in the building. There are currently over a thousand students in Longmeadow High School and given the current curriculum demands of 8 blocks, excess capacity does not exist. A phased approach was considered but the architects, educational professionals and residents all voiced serious reservations and concerns about this approach. In addition, given the significant amount of asbestos in the walls, they determined it was not the most economical long term solution and it was not the best use of tax payer dollars. As we move quickly to a decision on this critical project for Longmeadow, Mr. Gold fails to point out several of our neighbors who have in last 10 years considered new construction in lieu of renovation. They are the Putnam project (renovated roughly 23 yrs ago and ripe for a new building). Putnam, as we know, has now come in UNDER the projected construction costs in recent bids. West Springfield, Easthampton, Granby, Chicopee - 2 High Schools, Somers, CT; Suffield, CT; and Agawam - expected Statement of Interest before June 2010. My position on this project is quite well known. I support this project for many reasons including best use of tax payer dollars, operational savings, educational opportunities, community use and a building that will serve the community of Longmeadow for the next 50+ years. This is 44 million dollar building project that is an investment in the future of Longmeadow. I urge you to Vote Yes at the Town Meeting on May 25th and again at the ballot box on June 8th. While the transparently irrational arguments against the new high school are self rebutting, the economic arguments have at least the appearance of reasonableness. In truth, they are arguments that were thoroughly considered during the lengthy and very open process that has culminated in the commitment of $34 million in state funds and the Longmeadow School Building Committee recommendation that will be on the special town meeting warrant on May 25th and the June 8th ballot. 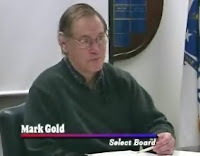 Some critics argued that “the town can’t afford this project at this time.” Select Board incumbent and candidate Mark Gold continues to maintain this claim. The evidence to support it, however, is difficult to find. A brand new high school, judged appropriate for high quality, state of the art education for many decades to come with a price tag of $78 million would have been unimaginably inexpensive just a couple of years ago. The contribution of $34 million of that amount by the Massachusetts School Building Authority makes a good deal a great opportunity. Mr. Gold suggests that we should have chosen an option that would have been $10-15 million dollars less expensive and recommends that the town should take a much more incremental approach to repairing the high school in several phases over an 8-10 year period. The fact that such an option was thoroughly studied by the School Building Committee, and that the cost of such an option would far exceed that of the proposal on the table, is curiously ignored by Mr. Gold. Implications by Gold and others that other capital projects should be undertaken before or in tandem with the high school project were equally well considered during the comprehensive development of the high school project and rejected by a committee that included the would be direct beneficiaries of these other capital investment possibilities. Another criticism of the proposed project is that “too many Longmeadow residents cannot afford the additional $600 dollars a year for the life of the bond that this will cost.” The most significant problem with this claim is that it is a private, or individualistic, objection to a public, or collective, investment, the logic of which condemns ALL public investments. The advocates of the proposed project have thoroughly demonstrated the financial prudence of this investment “for the town,” but this argument essentially reframes the issue as an individual taxpayer burden that (its proponents hope) cannot be as easily justified. Particularly vulnerable from this perspective, according to proponents, are the “elderly residents on fixed incomes” for whom the additional tax liability could be overwhelming. The political force of this argument is magnified if supporters of the project at issue accept this frame and try to argue that the cost is not an unfair or unnecessary burden on economically vulnerable residents. The reality is that no one could ever argue for any capital investment if this individual taxpayer frame is accepted. Were the voters of Longmeadow to allow themselves to see this investment from this perspective and vote against it, they would, at best, be exercising misplaced and very counter-productive compassion because without sound investments in our town’s capital assets each taxpayer’s most valuable capital asset (their home) will continue to lose value, which jeopardizes the financial capacity of both individuals and the town to maintain quality of life standards. Rather than antagonizing residents who worry about the additional costs to their tax bill, fair-minded voters and supporters of the proposed project should be open to community-based assistance to economically vulnerable tax payers. We really are all in this together, and when a few of us have trouble moving forward it’s up to the rest of us to help everybody keep up, not by stopping and failing to progress, or by leaving anyone behind. Simply saying no to sound investments like the new high school pulls everyone down, which would be the real injustice. The economic arguments against the new high school simply don’t add up. Vote YES on May 25th and on June 8th. 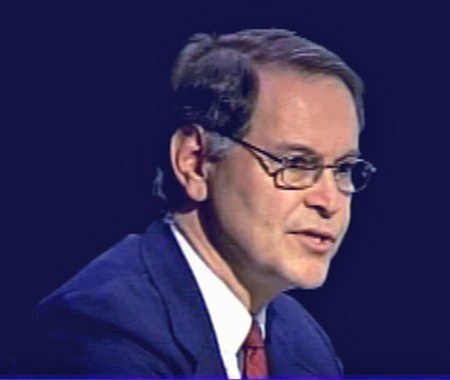 Jerold J. Duquette, M.P.A, Ph.D.